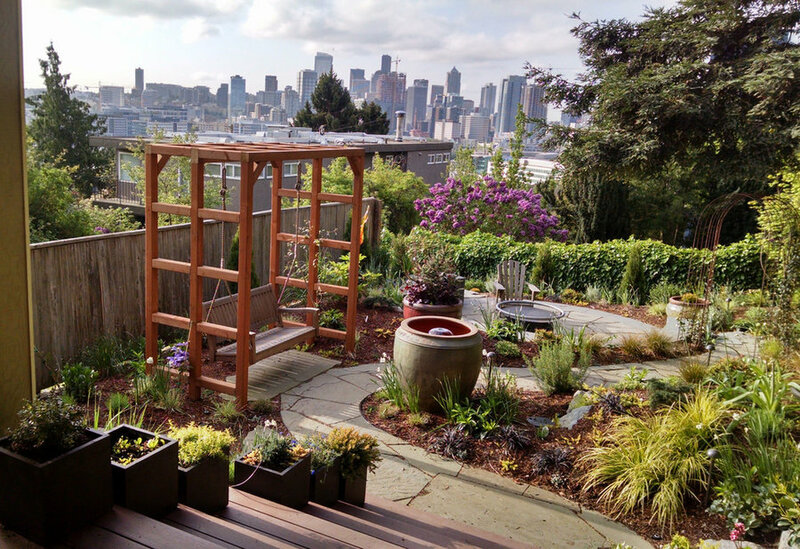 GOAL: This urban view home on a steep site needed a usable, welcoming landscape that highlighted the views and included a new chicken coop and vegetable fruit garden. New concrete was poured in the entry and large stones connect it to the back garden while leaving room for seating for two. 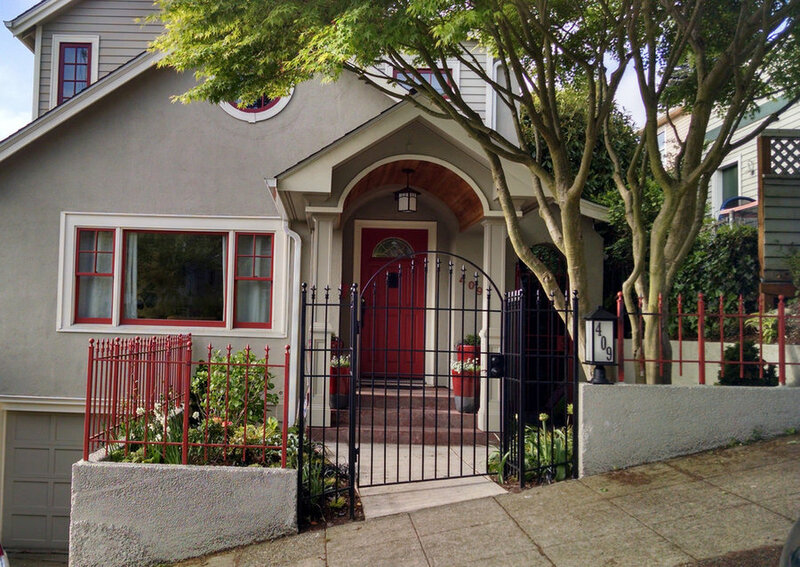 A new recessed tall gate matches the existing metal fencing and adds definition to the 1930's home. The plantings are largely evergreen for interest all year long. In the rear, the upper deck looks out over the new landscape to the city view. Below, a stone terrace of bluestone has a lighted curved seating wall and a fire bowl for enjoying cool nights. New generous stairs connect to a curving stone pathway that leads to a trellised garden swing, winds by a large pot fountain, and continues through three vine-covered wire trellises to the new recessed circular terrace. 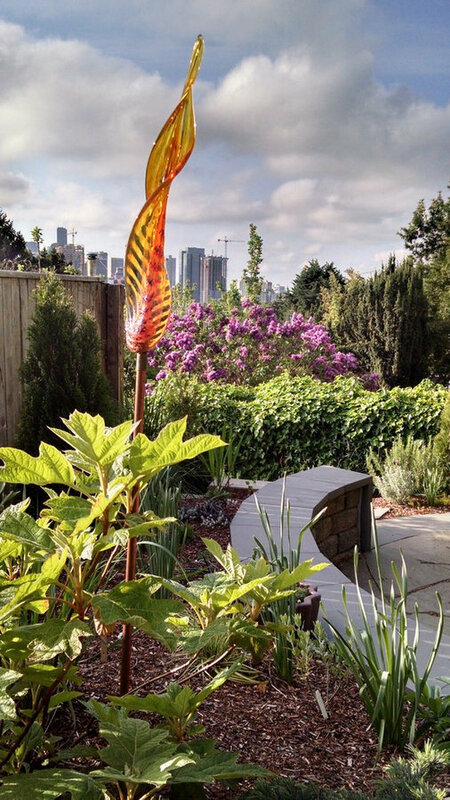 Many native plants and other ornamentals have been newly planted to fill the garden with bright cutting flowers, lush grasses and evergreen shrubbery, vines, and ferns. Land2c photos Entry is now crisply defined with a surround of fenced walls with an arched metal door repeating the home's architecture, The old porch support columns were reclad to create a grander entry. A lit address light was added, smooth new concrete walk, and welcoming plantings greet guests. The old maple tree has been well-pruned to allow more light into the entry. Plants are bright and have four seasons interest. The red fence will be painted matching black soon. The new entry was poured to meet the angle of the stair risers and the city sidewalk. 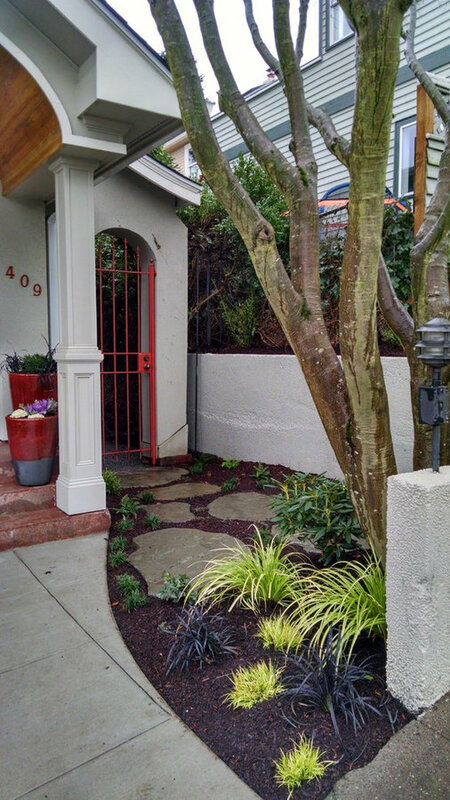 The existing exposed aggregate concrete retaining walls were skimmed and painted to mimic the stucco finish of the house. The iron fencing will be all black. All now appears to be original to the home's era. Land2c photos The entry way has new stones connecting the entry path to the rear garden gate. The old porch support columns were redesigned and enlarged to create a grander entry. Soon two chairs will be tucked against the right wall to enjoy the view. The stairs flanked by pots for herbs lead to a curving pathway. It ends at the sunken circular stone terrace and a fire bowl. The 3 arched trellises form a doorway between the newly planted garden and the view terrace with a retaining/seating wall. The large water pot feature baffles the urban noise. 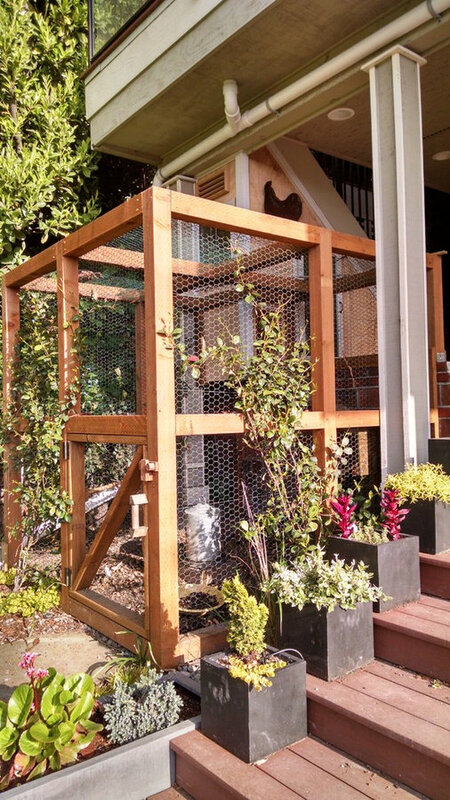 The open grid swing trellis matches the rose trellis and echoes the chicken coop architecture. Clematis, Star jasmine vines and roses will grow up the grids--the first purple blooms show in the picture! The expansive view is enjoyed from everywhere. Berms around the terrace and inside the curve of the path create visual interest and the feeling of moving through the landscape. Down cast path lighting creates safety at night with a minimum of light pollution. The huge sequoia tree is softly lighted for night interest. The original fence will be soon be covered with many flowering vines. 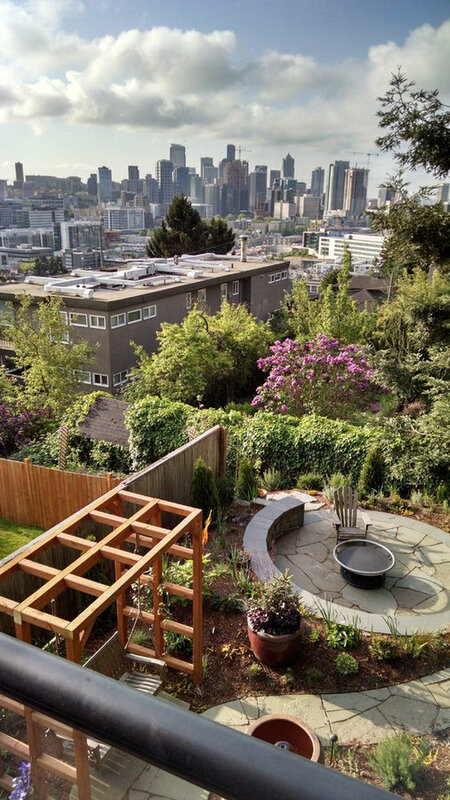 Land2c Photo The curved seating/retaining wall provides a wonderful view of the city. Plants will grow in to soften the circular stone terrace. Glass art adds a pop of color. Land2c Photo Exterior of chicken run and pots for herbs on new, graceful stairs. The old chicken coop and run was demolished and a new, custom coop and run were tucked under the deck. and stairs. Star Jasmine isplanted around the run-- not harmful to chickens. As it grows it will blend the run into the garden and create more shady areas for the chickens. Human access to the run is concealed as one of the frame squares. The frame will be painted to match the house trim color. Dark vinyl coated chicken wire was used to be less visually noticeable. The stair pots provide room for herbs to grow. 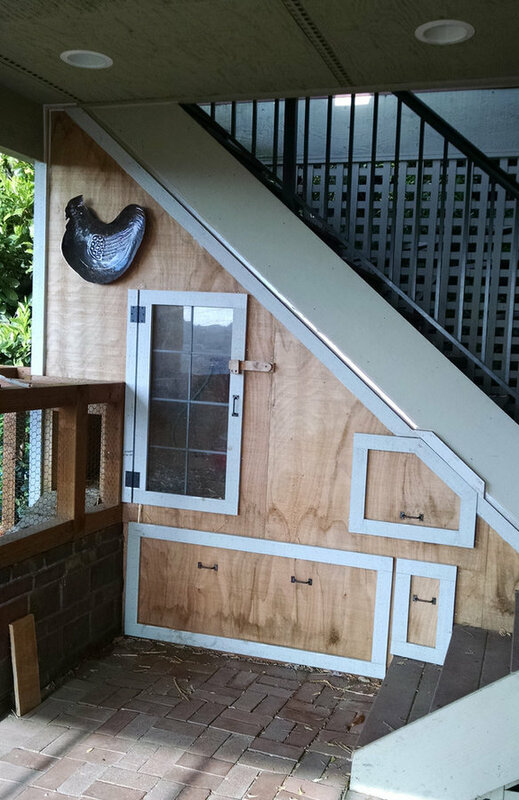 Land2c Photo Chicken coop tucked under stairs to upper deck gives maximum space for roosting and nesting by developing previously unused space. Slide out feeding, nesting, and cleaning boxes are convenient. Storage for straw and feed is in the bottom drawers. Automatic watering and feeding systems were added. Access to the run cage is via a switch back ramp. The coop will be painted to match the house color. Land2c PHoto Antique rose has a new open grid trellis which matches the trellis suspending the garden swing nearby and coop. Paint to match the home's trim is coming soon. 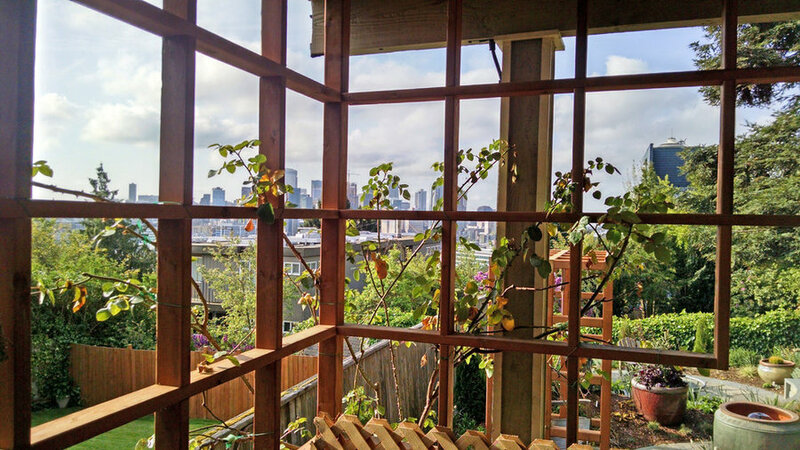 As the rose grows it will create a denser privacy screen between the porch and a close neighboring house.